What is Water Dispenser JB, Johor Bahru, Malaysia Supply, Supplier, Supplies, Import, Wholesales, AlGreat Sales & Services Sdn. Bhd. What is Water Cooler or Water Dispenser? A water cooler or water dispenser is a device that cools and dispenses water. They are generally broken up in two categories: bottleless and bottled water coolers. Bottleless water coolers are hooked up to a water supply, while bottled water coolers require delivery (or self pick up) of water in large bottles fromvendors. The most common form of the watercooler is wall mounted and connected to the building's water supply for a continuous supply of water andelectricity to run a refrigeration unit to cool the incoming water, and to the building's waste disposal system to dispose of unused water. Some versions arefreestanding floor models, which are becoming more popular in countries where it is not common to drink water straight from the tap. In the standard wall-mounted cooler, also commonly referred to as a water fountain or drinking fountain, a small tank in the machine holds chilled water so the user does not have to wait for chilled water. Water is delivered by turning or pressing a button on a spring-loaded valve located on the top of the unit, that turns off the water when released. Some devices also offer a large button on the front or side. Water is delivered in a stream that arches up allowing the user to drink directly from the top of the stream of water. These devices usually dispense water directly from the municipalwater supply, without treatment or filtering. A newer, free-standing design involves bottles of water, usually treated in some way, placed spout-down into the dispensing machine. To install the bottle, the bottle is tipped upside down and set onto the dispenser, a probe punctures the cap of the bottle and allows the water to flow into the machine's internal reservoir. These machines come in different sizes and vary from table units, intended for occasional use to floor-mounted units intended for heavier use. Bottled Water normally is delivered to the household or business on a regular basis, where empty bottles are exchanged for full ones. Commonly a cup dispenser can be mounted to the side of the unit to keep disposable paper or plastic cups handy for use. The bottle size varies with the size of the unit with the larger versions in the US using 5-US-gallon (19 L) bottles. This is also the most common size elsewhere, labelled as 18.9 litres in countries that use the metric system. Some units offer a refrigeration function to chill the water. These units do not have a place to dump excess water, only offering a small basin to catch minor spills. On the front, a lever or push button dispenses the water into a cup held beneath the spigot. When the water container is empty, it is lifted off the top of the dispenser, and automatically seals to prevent any excess water still in the bottle from leaking. These gravity-powered systems have a device to dispense water in a controlled manner. 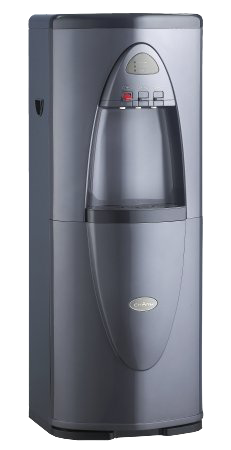 Some versions also have a second dispenser that delivers room temperature water or even heated water that can be used for tea, hot chocolate, or instant coffee. The water in the alternate hot tap is generally heated with aheating element and a hot tank (much like the traditional hot water heaters used in residential homes). Additionally, the hot tap is usually equipped with a push-in safety valve to prevent burns from an accidental or inadvertent pressing of the lever. Table top or kitchen worktop versions are available which utilise readily available five liter water bottles from supermarkets. For example the one by design house Warwick Design shown. These coolers use air pumps to push the water into the cooling chamber and Peltier devices to chill the water. A new development within the water cooler market is the advent of countertop appliances which are connected to the mains and provide an instant supply of not only chilled water but also boiling hot and hot water. An example of this new technology is the T6 water dispenser. It filters tap water through a double extruded activated carbon block and a 11 watt computer controlled Ultraviolet (UV) lamp.